Welcome to another installment of If My Book, the Monkeybicycle feature in which authors shed light on their recently released books by comparing them to weird things. 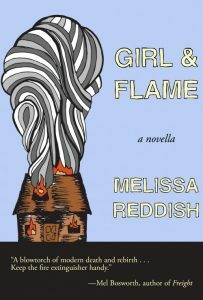 This week Melissa Reddish writes about her new novella, Girl and Flame, just published by Conium Review Press. If Girl and Flame were a leaf, it would be a maple, marbled red and orange and gold, on a tree-lined path through the woods. When you bend down to examine it, you will realize it is fake—mysteriously, inexplicably: a perfect silk replica surrounded by so many real leaves. You won’t be sure if this makes the leaf more or less rare, more or less beautiful. If Girl and Flame were a sweater, it would be a large white unicorn surrounded by roses. A teenage girl wearing sparkly blue eyeliner in a thrift store would hold it up to her chest and laugh about the middle-aged soccer mom who would buy it, and the guy in too-tight jeans would agree with a chuckle. Then the same girl would sneak back the next day to buy it but it would be gone, replaced with another blue-and-white striped sweater from Abercrombie & Fitch. If Girl and Flame were a tune that got stuck in your head, it would be one that had an electronic beat and haunting female vocals, one that sounded both hopeful and sad, one that reminded you of getting second place in the hula-hooping competition on Field Day while your dad packed your family’s only suitcase and left town. If Girl and Flame were a flavor of ice cream, it would be chocolate, because all the other flavors are trying too hard. 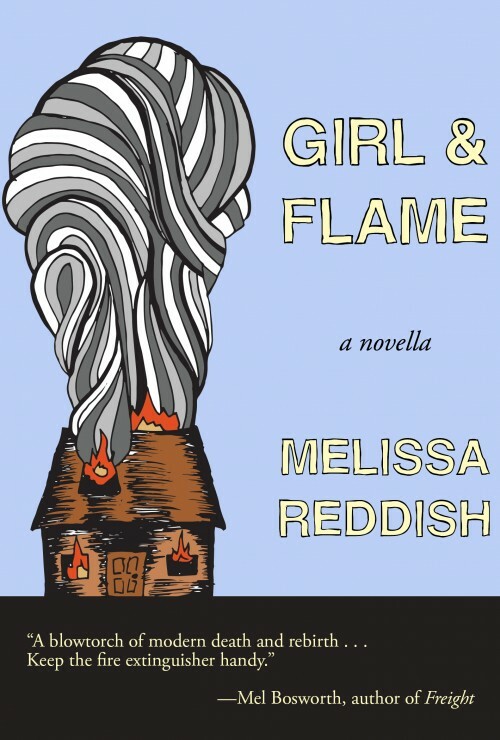 If Girl and Flame were a love letter, it would be addressed to Buffy the Vampire Slayer, Gilmore Girls, Joan Jett, Garbage, Fiona Apple, Joan Didion, Margaret Atwood, and my mom. If Girl and Flame were a dog, it would be a fat dachshund who just wants to sit on your lap and take a nap. If Girl and Flame were a cat, it would be a black cat that poops in your shoes while maintaining inexplicable eye contact. If Girl and Flame were the Empire State Building, it would have a unique perspective on the history of our country, but it would be too distracted by the constant melodrama of the bored/ desperate/ falling in love/ uncertain/ nose-picking/ soul-searching/ pretentious/ insane/ selfish/ selfless/ just trying to get by people that visit it every day to express that perspective. If Girl and Flame were a feeling, it would be the goosebumps you get when your unrequited love brushes his or her fingers through your hair to loosen a snarl, and you aren’t sure whether to interpret that as affection or a passive-aggressive statement on your own grooming habits. If Girl and Flame were a YouTube video, it would be the one where a rat drags a piece of pizza down the NYC subway stairs. If Girl and Flame were an existential dilemma, it would be the moment you smash a small bug with your shoe to discover that it is not just any bug but a lightning bug, and the despair you feel at the tiny glow snuffing out is heightened by the knowledge that this is exactly what happens to every skittering creature you decimate, metaphorically at least, and for the briefest of moments you consider Jainism before you return to your homemade Naan pizza and yourself: wholly intact, completely unchanged. If Girl and Flame were a wish, it would be that some time this week, as you glance out the window at the old hippie couple walking their old hippie dog, you feel a sudden and intense feeling of déjà vu, which is simply the universe tapping you on the shoulder to let you know that your life is heading in the right direction. Melissa Reddish’s short story collection, My Father is an Angry Storm Cloud, was published by Tailwinds Press in 2015. Her flash fiction chapbook, The Distance Between Us, was published by Red Bird Chapbooks in 2013. Her work has appeared in decomP, Prick of the Spindle, and Northwind, among others. Melissa teaches English and directs the Honors Program at Wor-Wic Community College. Follow her on Twitter at @melissareddish.